Fig. 5.2 Grossly enlarged submandibular gland. This develops if an impacted calculus is ignored. A neoplasm of the submandibular gland is the differential diagnosis if the enlargement is persistent and there is no evidence of a calculus on radiograph. The nodular surface and the firm, nontender character on palpation of this gland are also suggestive of a neoplasm, commonly a pleomorphic adenoma or adenoid cystic carcinoma. calculus obstructing the submandibular duct causes painful and intermittent enlargement of the gland. The swelling occurs on eating and regresses slowly. Secondary infection in the gland leads to persistent tender swelling of the gland. The swelling in the submandibular triangle is visible and palpable bimanually with one finger in the mouth. Fig. 5.3 Tonsillary lymph node enlargement. A tonsillar lymph node enlargement (arrow) may be similar to an enlarged submandibular gland. This node is frequently palpable in children, being more conspicuous at times of tonsillar or upper respiratory tract infection, and may become very obvious, as in this case. The node is soft and tender. Exact location of the site is important: It is posterior to the submandibular triangle at the angle of the mandible, and not within the sub-mandibular triangle. Fig. 5.4 Abscess formation in a submandibular triangle lymph node secondary to dental infection. Mumps may also cause a tender submandibular swelling, and an enlarged lymph node in the submandibular triangle, secondary to dental infection, simulates gland involvement. Fig. 5.5 Submandibular calculus impacted at the orifice of the duct. This is easily removed with local anesthesia in the outpatients. Fig. 5.7 Excision of the submandibular gland (specimen) is required for calculi impacted in the duct or within the gland (arrow). Care is taken in this operation to preserve the mandibular branch of the facial nerve which crosses the submandibular triangle to supply the muscles of the angle of the mouth. Fig. 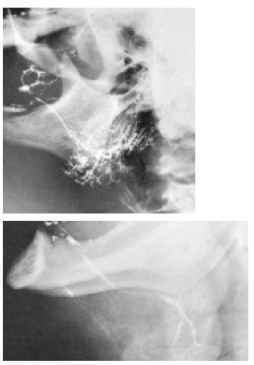 5.6 Submandibular calculi demonstrated on radiograph impacted in the duct. An anterior calculus may be removed by incision over the duct in the floor of the mouth, a suture being placed posterior to the calculus to prevent "slippage backwards" towards the gland. Fig. 5.8 Mixed parotid tumor (pleomorphic adenoma) (arrow). These present as a firm, smooth, nontender swelling. The growth is slow, so the history may be long. The bulk of the parotid lies in the neck posterior to the ramus of the mandible, and parotid tumors do not usually cause predominantly facial swelling. Fig. 5.10 Congenital hypertrophy of the masseter muscle. 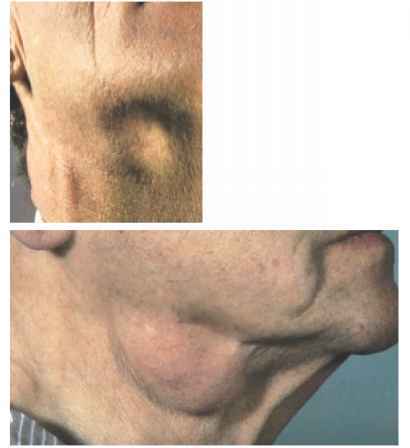 Careful palpation follows observation of a swelling, and what appears as a parotid mass here is palpable as a congenital hypertrophy of the masseter muscle. Fig. 5.9 Parotid swelling. A softer swelling in the tail of the parotid (arrow) may be an adenolymphoma (Warthin's tumor), a benign tumor of salivary gland tissue within a parotid lymph node. The pleomorphic adenoma is a low-grade malignant tumor, and is commonly in the superficial lobe of the parotid. The treatment is a superficial parotidectomy with preservation of the facial nerve. A soft parotid swelling with a short history and a partial or complete facial palsy is probably an adenoid cystic carcinoma or higher-grade malignant tumor of the parotid gland, requiring total parotidectomy with sacrifice of the facial nerve and radiotherapy. Fig. 5.11 Fine needle aspiration (FNA). A needle aspiration is a frequently used investigation for neck swellings. Aspiration from the neck swelling under local anesthetic enables histological examination of the aspirate smear to be made. This avoids the necessity of an incision and "open" biopsy, or biopsy excision of the node. Fig. 5.12 Mumps. Acute viral parotitis is a common infection, and the diagnosis is usually obvious. 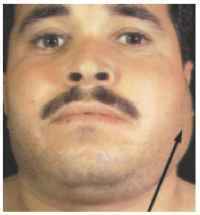 Well-defined tender swelling of the parotid gland, first on one side and shortly after on the other, with associated trismus and malaise, are characteristic. However, mumps can be deceptive when it remains unilateral and the swelling is not strictly confined to the parotid. 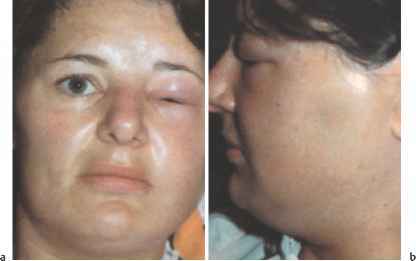 In this case of mumps (a, b), the swelling involved the side of the face, causing lid and facial edema. 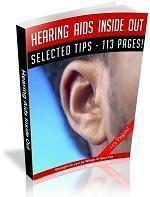 Unilateral total deafness is a complication of mumps. Fig. 5.13 Sebaceous cyst. A swelling in the parotid region (arrow), but on the face suggests another diagnosis. There is a small punctum on the swelling in this picture, diagnostic of a sebaceous cyst. Fig. 5.14 Sebaceous cyst on the face. Minor lesions such as sebaceous cysts present a problem on the face when excision is needed. Particular care is needed to enucleate these cysts meticulously, through incisions made within the relaxed skin tension lines. It may a Iso be necessa ry to "break-up" the straight incision line so that it is less obvious. 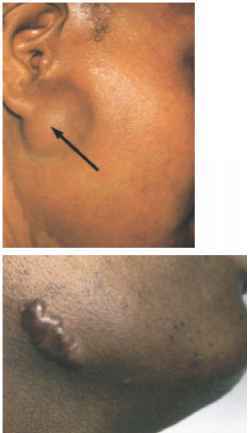 A keloid is a further concern, particularly in black skin. This followed excision of a sebaceous cyst in the upper neck. Fig. 5.15 Sialectasis of the parotid gland. This presents as intermittent episodes of painful swelling. 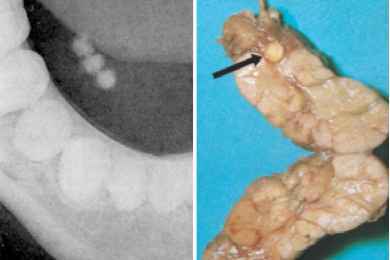 Calculi in the parotid duct are uncommon, and are not easily demonstrated on radiograph. An intraoral view is necessary. A sialogram confirms sialectasis, and the punctate dilations of the parotid ducts are similar in appearance to bronchiectasis. The parotid swelling with sialectasis is often infrequent and mild, and triggered by certain foods. There is no simple treatment; superficial parotidectomy is reserved for the rare, severe cases. Fig. 5.16 Normal sub-mandibular sialogram. The pattern of ducts not involved with sialectasis is demonstrated. A parotid sialogram is not difficult to perform, since the duct orifice opposite the second upper molar tooth is obvious and can be made more apparent by massaging over the parotid gland to cause a visible flow of saliva. The submandibular duct orifice anteriorly in the floor of the mouth is not obvious; cannulation for sialography may be difficult. Do salivery stones cause hearing loss? Can enlarged saliva glands cause hearing loss? Can a paratoid stone cause loss of hearing? 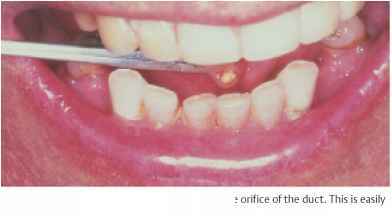 What is mandibular swelling image? How to palpate submandibular glands? Does a clogged salivia duct effect hearing loss speech? Can surgery on parotid gland damage hearing? Can siliva flow cause damage hearing? Can saliva stone effect hearing? 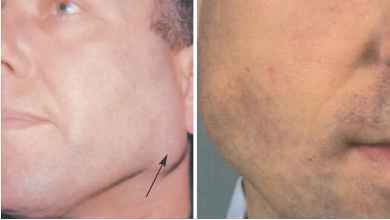 How long submandibular lymph node swollen? Can salivary stones cause hearing loss?